Ai Yamaguchi paints the life of infant courtesans, who reluctantly were sold by their parents and became solitary so that are in unlicensed brothel “Touge no Ochaya” (i) at a mountain path in late Edo period with unique base, delicate and palpable line and hue. 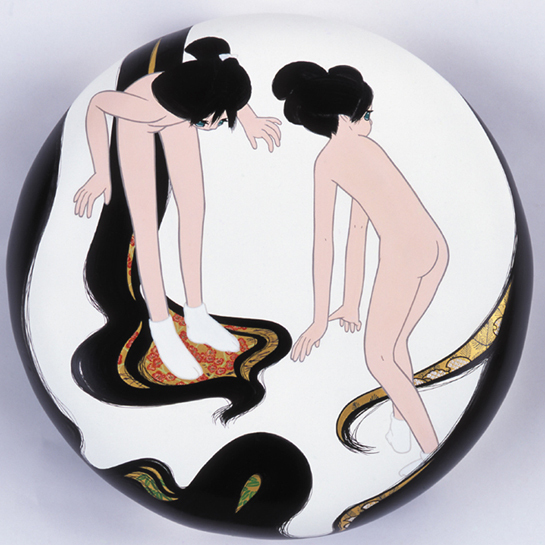 “Toge no Chaya” created by Yamaguchi is small and limited world for the girls who live there. So the things they see, hear and experience in their daily lives swell out with forming their imagination and wish. Simple and sharp feeling of infant courtesans is projected to seasonal grasses, smelling, patterns of clothing and WAKA poems, and then it mixed with them. So that they are emerged as the artistic form, even anxiety and jealously. We can always hear the small but earnest wish when we face up those tableaus. Those are produced by the artist’s way of the approach to the works that is “I just would like to create beautiful one”. There used to be the mound of Mt. Fuji as the symbol of Fuji Koh (ii) around Meguro area where Mizuma Art Gallery is located. For this exhibition, Yamaguchi got the idea of “Mt. 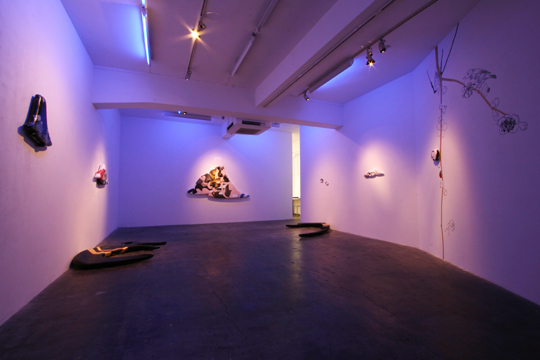 Fuji of Meguro” from that, and she started creating works under the theme of “the mountain”. The artist painted the appearance of Fuji Koh which courtesans imagined after they saw and heard about, and their mimicry of Fuji mi (iii). Softly rounded white canvases are perceived as the still snowed mountain in the spring. On the other hand combed black hairs of girls are extending to the top of the mountain as the mountain path to meet their wishes in their dream. The girls play at small imitation Fuji in their yard, sleep there and heighten feeling for Mt. Fuji in the dream and reality, even though they cannot see the real Mt. Fuji. In her recent shows, she has introduced the exhibition which people can experience the works as the whole installation even if the works disappeared like the mural painting, but for this exhibition, she has produced each work to be much higher quality. We would like you to see such new works that is the most concentrated and dedicated of Ai Yamaguchi.